Steury is the Natural Resources Manager for the GWM Parkway and has worked for NPS for over 20 years. 142 species new to the flora or fauna of Virginia: 9 non-vascular plants, 22 vascular plants, 1 vertebrate (reptile), and 109 invertebrates (2 worms, 1 crustacean, 3 mollusks, 14 spiders, and 89 insects: caddisflies, bees, sawflies, moths, beetles, and true bugs). 7 species new to the District of Columbia (all beetles). 3 species new to North America (1 vascular plant, 1 worm, 1 true bug). 74 species new to science: 1 crustacean, 1 millipede, 37 springtails, 13 mites, 8 flies, 8 moths, 5 beetles, and 1 sawfly, plus possibly 30 nematodes new to science. 106 species state listed for rarity (47 vascular plants, 3 mammals, 24 birds, 3 crustaceans, 6 mollusks, 3 dragonflies, 2 butterflies, 7 moths, 10 caddisflies, and 1 beetle). 3 federally-threatened species (northern long-eared bat, red knot, piping plover). 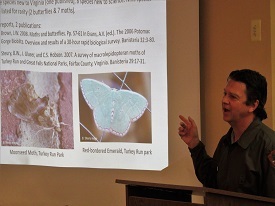 Brent Steury described the diversity of species so far identified on the 4,580-acre GWM Parkway. 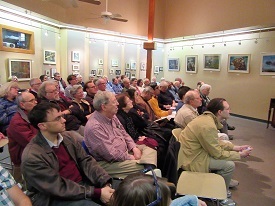 Sixty-five people learned about the Parkway's all-taxa inventory.Some of the previously undocumented species were observed in Dyke Marsh. For example, on September 6, 2018, FODMer Ed Eder saw a rare dragonfly, the fine-lined emerald (Somatochlora filosa). Steury said that FODM volunteers’ dragonfly and damselfly surveys have added four new species to the Parkway’s records. Steury and his colleagues have published 70 peer-reviewed journal articles in the last 12 years. For more information on the GWM Parkway, visit www.nps.gov/gwmp.